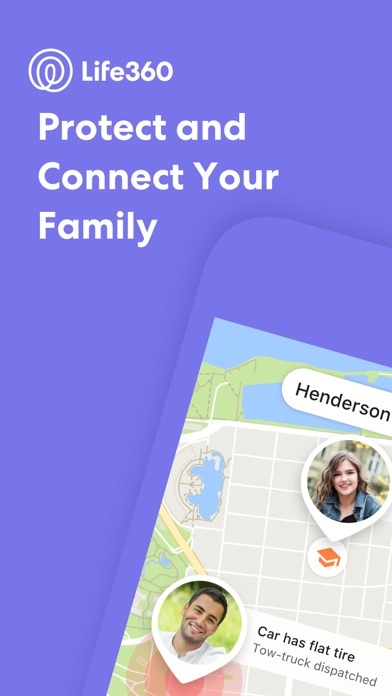 Life360 is the world's leading realtime, location-sharing app, and is the best way to coordinate with family and friends. Get automatic notifications when your family comes and goes from home, work and school, and when they complete drives. As seen on FOX, NBC, CBS, and more! Use Life360’s Family & Friend Locator to: * View the realtime location of friends or family members on a private map * Receive realtime alerts when friends or family arrive or leave home, work, and school * Share photos and text messages with our secure, private chat * See past location history for your Circle * See information after each drive to improve driving safety * Protect your family while they’re driving with our Crash Detection service * Track a lost or stolen phone “I have two new drivers. 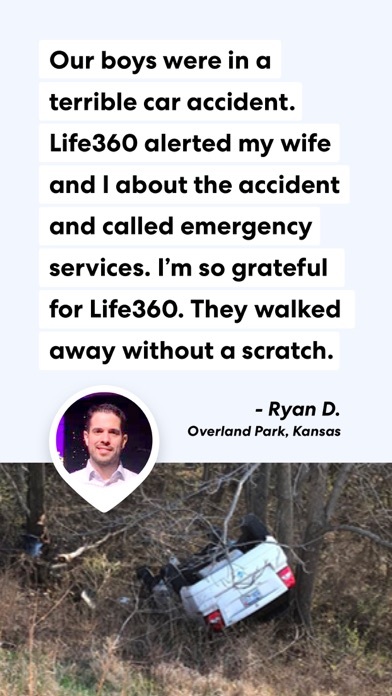 I feel more at ease when I can see info about their trips…Being able to not only know where my children are but also that they're driving safely is something I can't be thankful enough for.” - Miranda Carter Use GPS to find Friends and Family Life360’s Family & Friend Locator uses state-of-the-art GPS location data to report the realtime whereabouts of your friends and family. Simply install the Family & Friend Locator on everyone’s phone. Once registered, each member appears as a unique icon on the map so you’ll always know where your family members are. 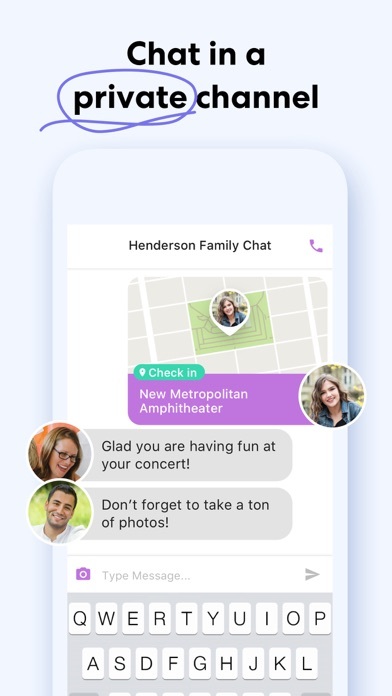 No need to send text messages asking “When will you be home?” The Life360 Family & Friend Locator tells you! Create geofence zones around your home, work, school, or anywhere you visit regularly. Whenever someone in your Circle arrives or leaves those locations, you’ll get a notification. Follow Your Family’s Driving Behavior With our latest features, you can see when your family is driving. Did your son just pass his driving test, and has taken to the road with the family car? Our premium driving features will let you see when your kids are speeding, driving irresponsibly, or texting while driving. Help them become better drivers and compare their driving to your own. Protect the whole family with our premium Crash Detection service. 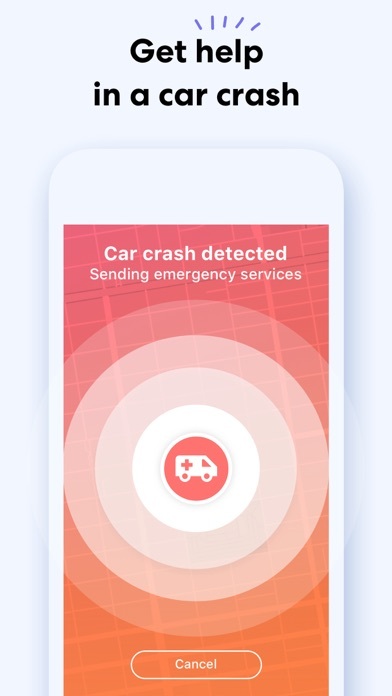 Using the accelerometer on your phone, Life360 can automatically detect if a car crash has occurred while someone was driving. Our software has been tested in BMW’s crash test facility, and we analyzed data from numerous real life car crashes. When we detect an crash, our trained emergency response agents can call the person involved in the crash within minutes and check if they’re ok. If they need assistance, we can automatically dispatch emergency services directly to their location. We can also contact the driver's Circle and family immediately after the crash, to give you ultimate peace of mind while your family is on the road. 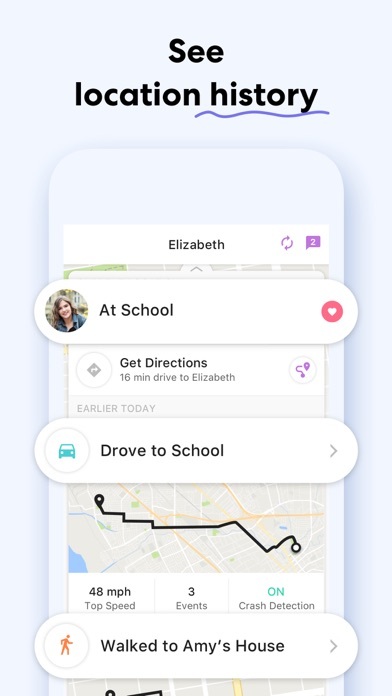 Life360 has the following subscriptions: Life360 Plus - $2.99/mo, 24.99/yr Life360 Driver Protect (US) - 7.99/mo, 69.99/yr Life360 Driver Protect (Non-US) - $4.99/mo, $49.99/yr With Plus, you receive 30 days of history, unlimited place alerts, and local crime alerts (US only). 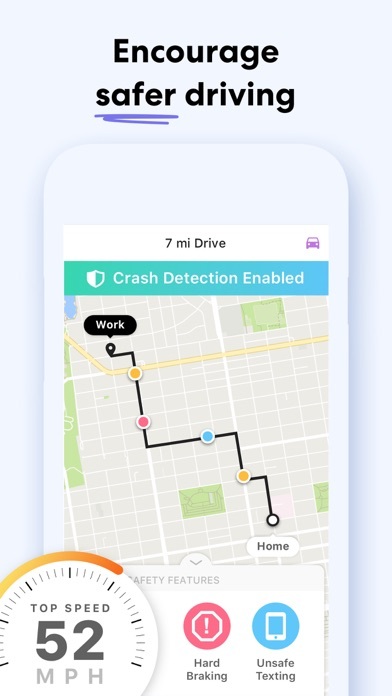 With Driver Protect, you get all the features of Plus, as well as driving analysis, 24/7 driver care support (US only), and crash detection (US only). All Driver Protect and Plus subscriptions have a free 7 day trial. After the trial ends, the subscription will auto-renew on a monthly or yearly basis. You will receive your first charge 7 days after starting your trial. You can turn off the auto-renew for this subscription at any time by going to your iTunes Account Settings. If you do not want to be billed during your trial, you must turn off auto-renew at least 24 hours before it expires. 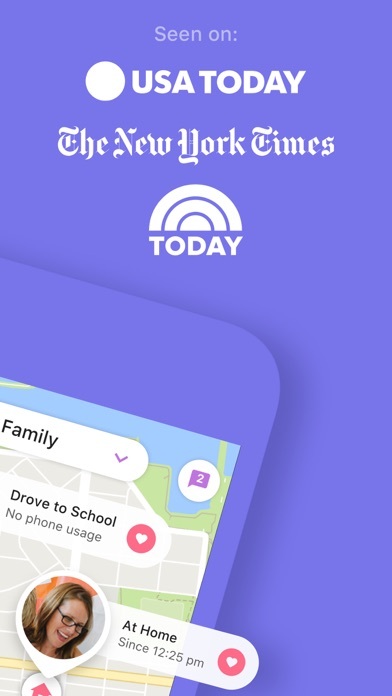 https://www.life360.com/privacy_policy/ https://www.life360.com/terms_of_use/ Disclaimer: Continued usage of location services while the app is in the background can excessively drain battery. But not to worry, we’ve spent 8 years developing our location technology and our algorithms always keep battery usage to a minimum, even while you drive! With the latest update I can’t see to find the button on how to check in. I have a teenage son that is about to start driving. This app is going to be great to be able to keep him safe, as well as helping him to sharpen his driving skills that he already has! Everyone in my family circle just loves having this app! No glitches, everything run smooth & well worth the monthly fee! Well it needs more detail when it comes to where is the location no zoom in to the streets nothing , it need a major improvement. Tracks the kids and driving. Able to find them all over town for pickup. Very handy!!! Free version does all I need for 2 phones! I never got this b4 bc I thought I had to have a subscription (25$/yr or 3$/mo) after 7 day trial to do anything, but the free version let’s me do everything, like see a breadcrumbs history up to 2 days back and have up to 2 places for geofence auto-notify upon entry/exit like work and home, clearly I didn’t read the description well. It runs in the background, as far as I can tell, even when the app is closed, unlike other apps that need constant maintenance to keep the breadcrumbs going. And there’s no annoying ‘location being used actively’ blue banner at top like other apps. The reason this is better to actually find ur phone than find my phone/Friends is simply the breadcrumbs. If ur phone is lost, it will quickly be stolen or run out of battery, and if stolen someone probably knows to put it in airplane mode so it can’t be tracked, but at least you can tell up to that point where it was, whereas find my phone wouldn’t work at all in without a signal. And this app is quick with responses, like loading breadcrumbs, in fact the quickest of all the apps I tried, which is critical when you’re panicked about ur phone. Let’s see how it runs in a year though, all these good reviews must amount to something, right? By far the best and most accurate locating app. Have used other apps and Life360 is by far better than the rest !